Yes here it is having just passed over the Hugh Low Bridge. Proceeding at a steady, somewhat leisurely, pace, the Trichair turned left and looked as if it was going to the nearby market. The photo was taken around 10.00 am on 23 July 2013 when I overtook them on the bridge and having pulled over sharply, jumped out of my car and caught them with the iPhone. They were totally unfazed with my performance, with the lady lightly gripping the side bars – completely comfortable in her plastic chair. 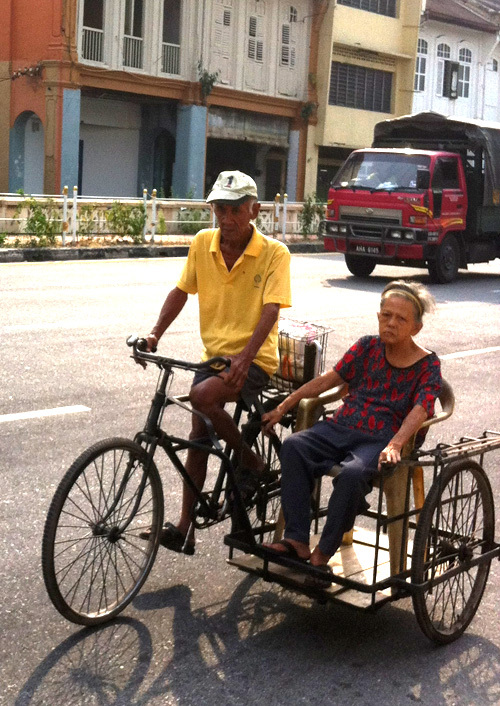 By the time I had got back in my car they had disappeared into the traffic..
With the Trishaw no longer allowed to ply for fares in Ipoh, the Trichair is clearly the way ahead for those who don’t have cars, but I wonder what MBI would say if a few dozen of these hit the streets. This improvised trishaw is not safe. The chair isn’t steady. Surely illegal if it were meant for fare earning. The look of defiance on their faces speaks volumes. What can DBI or anyone else do? Fine them? They are too old to give a hoot! You wanna take the rickshaw off them? Just try! What interested me was the building opposite the road…..are there vacant or still occuppied? When I glance thru this blog, it hardly relate to what I see Ipoh today …the gloria day of Ipoh down town!!! It isn’t safe but I can’t see if they break any law. You don’t need a licence for a bicycle or tricycle, right? My brother Mano will remember how we transported in 1957 all our belongings from Lahat Road; above my grandfather’s goldsmith shop to our father’s brand new house in Lahat Avenue, using the borrowed tricycle from the sundry shop next door. We made many trips after working hours and it was fun especially moving into a proper house with all its facilities. I was too short to reach the pedals, so I helped in the carrying the pots and pans etc and pushing the tricycle. The return journey was a free ride on the tricycle. Wow. Pardon me if I am mistaken, but this lady looks familiar and she may live across the Kinta River somewhere in Kg Paloh. i have noticed this transport arrangement as i was supervising some renovation works around that area. it could be one of her rides to new town area. It does raise the question of means of transportation for the elderlies who cannot afford their own car or too old/frail to drive and have no children or relatives/friends to call on. What an interesting set of comments sll arriving within a few hours of the posting. The picture although posted for fun does raise a lot of serious points regarding care of our elderly, public transport availability, safety, the law and so on. I am glad it got some of those thoughts down for all to see. Regarding the buildings, some are still housing old trades like the Chick blind maker and sign carver, downstairs, but in the main the upstairs are unused. Others have been empty and derelict for years. Such is life in Ipoh.